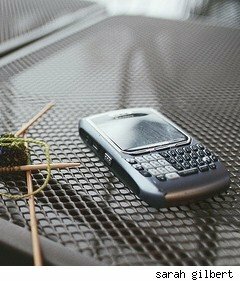 Blackberry billing: Does afterhours email deserve overtime pay? My boss has approved the purchase of Blackberry phones for the entire group. We all need to be accessible anywhere; and late at night as our remote team bounces through its family and social life, emails fly back and forth. There's a big uptick after kids are put to bed, and another blast right around midnight right before team members head to sleep themselves. We're always on, and the dark circles under some of our eyes attest to the strain. Is this healthy? Probably not, and more and more people are starting to protest their boss' strongly-worded requests that we be available after our workday is over. (Not our team. We love our work! Really! You're reading this, Brad, aren't you?) It's especially testy in jobs managed by unions, whose purpose it is (after all) to look out for their members' best interest. This month ABC News and its writers have been in a big kerfuffle over answering email after hours; the Writers Guild of America, which represents the writers, has been demanding that employees receive time-and-a-half for using their Blackberries. The WGA spokesman quoted in a New York Times article said that a few minutes of looking at emails wasn't the issue -- it's more about writing material and coordinating guests, and the like, insisting that, "people are entitled to time off the job. BlackBerrys can be liberating ... But they can also shackle people to their jobs." ABC responded by taking Blackberries away from three of its employees (real mature, guys, take your ball and go home, won't you? ), and the two parties came to a resolution June 24th (it wasn't detailed). But there are big issues at play here. On one hand, I use my Blackberry for personal emails and for utility -- to find out when the next bus is coming, for instance, or how to get to my doctor's office -- so it's definitely a perk and answering a few emails late at night might balance out in the end. On the other hand, we're beginning to be the most overworked, stressed, unhealthy people of all time and our great technology could be to blame. As Tracy Coenen pointed out, typing on your Blackberry is rude, too. So which is it: rude, unhealthy, and a strain on workers; or a perk that should be considered just part of a day's work? What do you think?